British cheese is enjoying a revival, with a proliferation of local artisan cheeses springing up in farmhouses across the country. One of the success stories is Cornish Yarg, a semi-hard cow’s milk cheese made only in Cornwall, on a farm near Truro. It has attained global recognition and is a versatile cheese that lends itself to many recipes or just adding a touch of West Country flavour to your cheese board. Yarg’s recipe was passed on to the Lynher Dairies company by a local couple, who said the cheese dated back to the 13th century. Many buyers think that Yarg must be an ancient Cornish name but in fact it is just a reversal of the couple’s surname, Gray. Yarg’s distinctive flavour comes from its wrapping of nettle leaves. They were originally used to preserve the cheese but impart a noticeable taste and also encourage the growth of an edible mould around the rind of the cheese as the cheese matures. 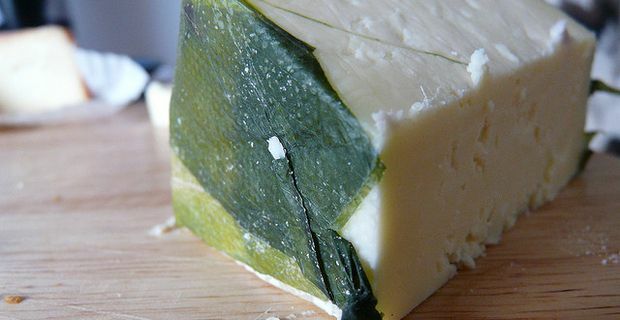 A wild garlic version of the cheese is also available. Yarg’s creamy but robust taste make it ideal in quiches or tarts. Combine yarg with eggs, spinach, cream and a little grated nutmeg and bake in a shortcrust tart base for a perfect summer quiche that is healthy and tasty. When asparagus is in season, substitute this for the spinach for a luxurious variation. Broccoli would also work well with yarg. Chopped and mixed with breadcrumbs, oatmeal, spinach, bacon and seasonings, and bound with an egg, yarg makes excellent sausages. Serve with creamy mash and a green salad.